With the arrival of the Raspberry Pi my interest in interfacing with technology and sensors has been rekindled. So digging out the RM9011 I have spent a happy few hours figuring out how to interface this with the Raspberry Pi using some discreet logic circuitry and using a serial console (minicom) to configure and test different scenarios with sensors and LEDs. Using Python I've also coded some scripts to run various monitoring and output scenarios. As this module is way out of date, considered legacy and I've not been able to find spares or originals I have decided not to use it for any serious projects. 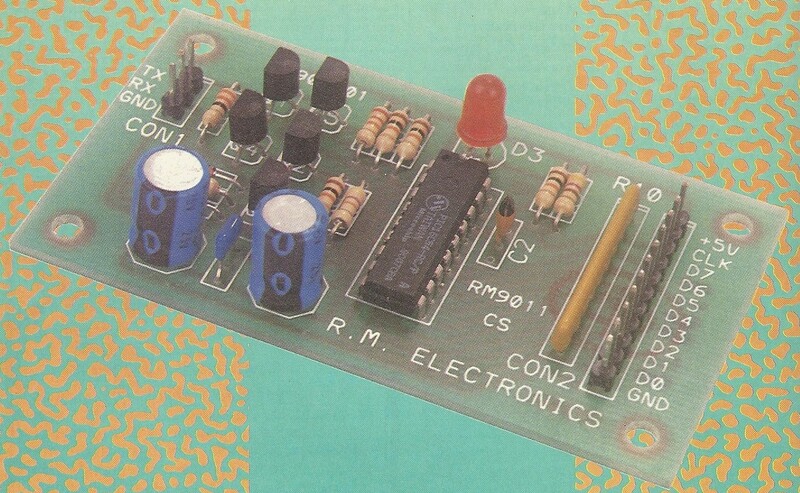 However, for completeness for this article I've included a description of the module, an image of the board together with the circuit diagram (courtesy of Maplin magazine - January 1992). RS232 to 8-bit digital I/O converter module - introduced in 1992 by Maplin Electronics, made by R.M.Electronics. Each input/output line individually configurable as input or output. Bit or byte read and write. Configuration changes made via RS232 / Serial interface maximum speed 1200bps. I/O Lines TTL / CMOS compatible. While searching on-line for information on serial to digital converters to take the place of the RM9011 I found this device - the DACIO300. The DACIO300 by Tronisoft in many ways has some similarities to the RM9011, though much more advanced and more importantly still available to purchase. The way it is controlled is also similar to the RM9011, in that ASCII characters are sent to the interface board via RS232/Serial. This method of operating lends itself to being controlled directly from a serial console, such as minicom on the Raspberry Pi, or from the Raspberry Pi using Python serial commands or Arduino using serial print commands. This board is fully populated but it is possible to buy this unpopulated and exclude many of the components from the board depending on how it might be used. It is also possible to buy just the pre-programmed chip to build your own project(s). A single RS232 IO board provides two 8-bit digital input/output ports and up to 8 analogue input channels to computers equipped with a spare RS232 COM port or via a USB to serial converter such as item 2455 or 2327. Easy to use communication and control open protocol. Details about the RS-232 standard are available and provides useful information about remote operating distances. Connecting the Raspberry Pi to the DACIO300 is relatively straightforward. 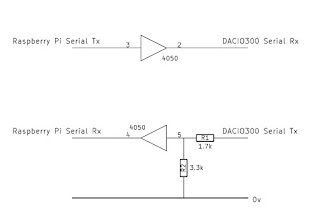 The serial transmit output from the RPi is connected to the serial receive input on the DACIO300, and the serial transmit from the DACIO300 is connected to the serial receive input on the RPi. 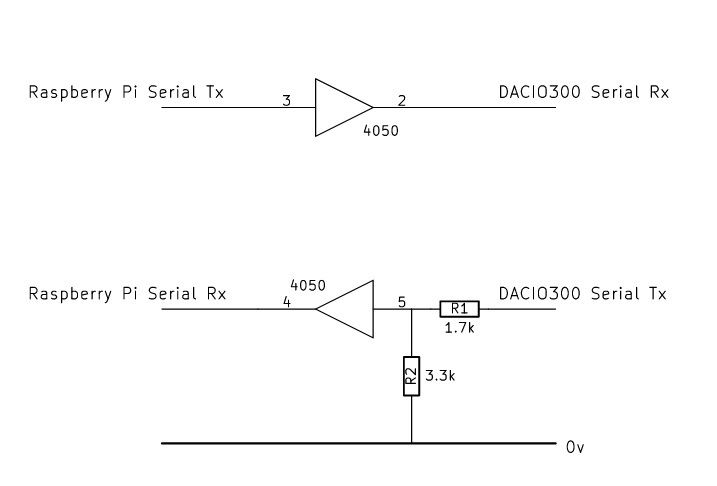 There should be no direct connections between the two devices as the RPi operates at 3.3v while the DACIO300 operates at 5v. 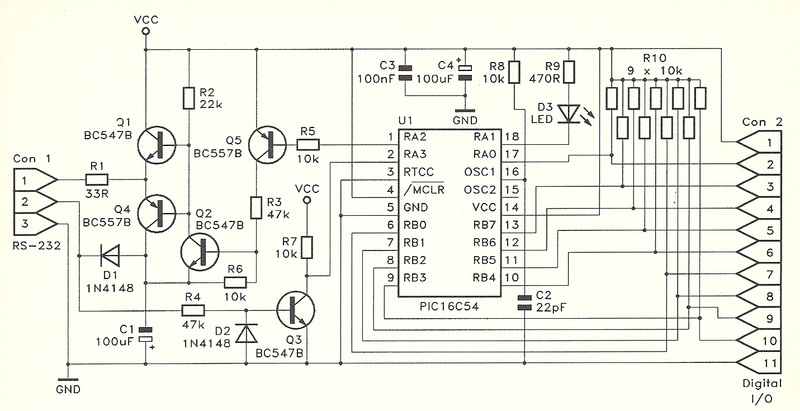 It is necessary to provide an interfacing circuit between the two as shown below. This simple interface allows the Raspberry Pi serial transmit port operating at 3.3v to connect via one hex buffer of the HCF4050 IC and connect to the DACIO300 serial receive port operating at 5v. In the reverse direction, the 5v serial transmit from the DACIO300 is stepped down to 3.3v (though not absolutely necessary) via R1 & R2 to drive another hex buffer whose output connects to the Raspberry Pi serial receive port. The HCF4050 is powered at 3.3v with pin 1 +Vdd and pin 8 Ov or Vss. I have also used an Arduino clone (RasPi.TV Duino) in the same way to successfully interface with the DACIO300. Here are a few simple examples of how the DACIO300 inputs and outputs could be used. Port A comprises 8 bits, channels 0 - 7 and is by default an analogue input port. Ports B and C are both 8 bits, channels 0 - 7 digital ports, Port B by default is set as inputs and Port C as outputs. Both Ports B and C are configurable at bit/channel level and can be either inputs or outputs. The commands to interact with the DACIO300 are straightforward and comprise a string of ascii characters forming a command. If a valid command is received, the module returns a '!' followed by any data requested. This command is instructing the module that Port C has a decimal byte value of 255 written to it. This command reads bit x (0-7) from Port B, where the reply is !x<0D> where x is 1 or 0 and 0D is a carriage return character. This command reads the whole of Port B and returns a decimal byte value. Further details are provided in the DACIO300 manual to translate the numeric reading to a voltage level. Many other commands can be sent to the module to set Ports as inputs or outputs, to read ports at a bit or byte level, to write out data to the digital ports at bit or byte levels, and to read the analogue port values. Full details and instructions are detailed in the DACIO300 manual which is a very clear useful guide. I have experimented with this module running various scenarios of reading digital values at both bit and byte levels and setting digital values again both at bit and byte levels. Using a minicom terminal running at 9600 enables some simple experimentation to confirm the principles of what I've thought is possible. I've then followed this with using Python3 scripts to send and receive serial messages to configure, read and write date to and from the module. 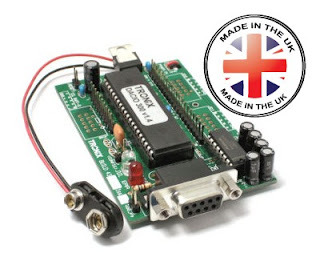 I can see this module has many practical uses where a simple and reliable serial connection is preferred over alternative I2C and SPI interfaces. # only when GPIO port 17 is set high. # These levels can be used to drive LEDs, relays etc to reflect Port B status. 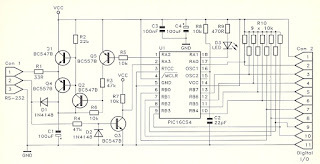 # to drop the TTL 5v to 3.3v, which is then connected to hex input on IC4050. # the corresponding hex o/p at 3.3v is connected to RPi GPIO serial input.